To be deified, we cannot be ‘couch potato’ or ‘arm chair’ Christians. It’s easy to fall into a rut, preferring our own opinions and ways to those of the Church, listening to the culture instead of Christ, taking Orthodoxy on our terms, but that isn’t Christianity and it won’t bring us the healing and growth in the Kingdom that you and I need. The Tongue: Asset or Curse? We witness through the Gospel today the healing of two blind men.. And through this life-changing encounter in which Christ’s power is in full evidence, we’re presented with the opportunity to grow to a fuller understanding of our own healing and salvation. Responding to their plea for mercy, the God of mercy, Jesus Christ, receives the two blind men into His presence and He heals them. But Jesus doesn’t perform this great miracle randomly. 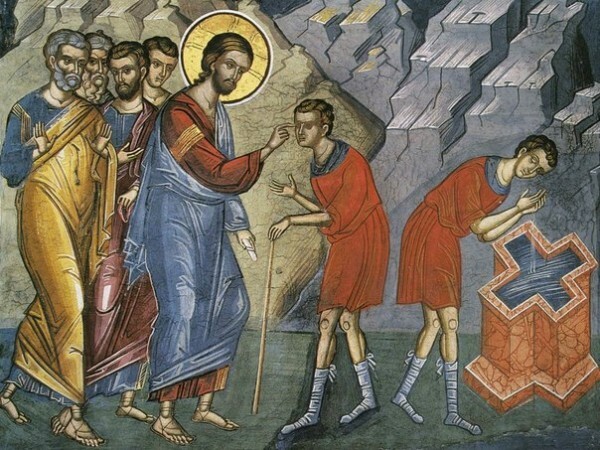 Rather, like the healing of the paralytic last week, we’re taught a lesson in faith and healing that is also applicable to our own need for Christ’s healing touch. Sometimes we assume that it’s God whose withholding growth or healing from us. But what we learn over and over again through the witness of the Scriptures and the lives of the Saints is that it’s us who have to be ready and willing to accept God’s healing, to get ourselves into Christ’s near presence, to have the faith to present ourselves to Him for the healing we need. To paraphrase St. John Chrysostom, Christ doesn’t run after those in need of healing everywhere, lest anyone think He’s healing out of vainglory. No, there’s more at work here: Christ’s healing presupposes a participation, a cooperation, from those who are healed. Just as our relationship and communion with Him necessitates a participation on our part, by definition: a return of love, an act of repentance and an abandonment of self-will when it is in disobedience to Christ and His Church; our healing bespeaks a reciprocal relationship. In fact, in most of the healings we see in the Gospels, those in need of healing personally seek out that healing from Christ. In other words, they desire that healing, they desire for Christ to touch them and heal them, they desire cleansing from their sins. They desire His visitation enough to seek Christ out, to entrust themselves to Him, to acknowledge their need for Him. They desire healing enough to step forward in faith, recognizing that God alone is worthy of their trust, that He alone is the Great Physician of our souls and bodies. The two blind men seek out Jesus; they follow Him, crying out to Him, “Son of David, have mercy on us!” These two men know the Source of mercy; they know that God alone can give such a mercy, such a miraculous healing. Do you see the involvement of their souls here, the relationship which Christ God develops between them and Him? Their volition, their will, was to be healed of their physical infirmity, their blindness, but it demanded the ‘eyes’ of faith and the strength of soul. Even still, Jesus doesn’t heal everyone today; not everyone receives physical healing. It remains a mystery. To some, like St. Paul, who petitioned God to remove the “thorn in his flesh,” God’s response was, “My grace is sufficient for you for My power is made perfect in weakness” (II Cor. 12). In other words, there was something about that ‘thorn’ that St. Paul ‘needed’ if he was to trust in God for his strength, to be humble before Him, to serve God to the amazing extent he did, converting whole nations to the truth of God and His salvation. 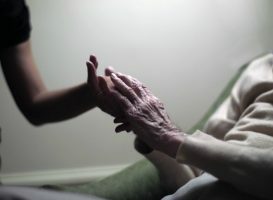 While our physical healing necessarily involves our will, our souls, the inverse is also true: the spiritual healing of our souls involves our bodies, our participation, our presentation of ourselves before God, our getting to the divine services, to Confession, to properly prepare for the Eucharist that it can work noetically in our souls for our deification, healing, salvation. When it comes to healing our eternal souls, we know that God desires this above all: He calls all to salvation from sin-sickness, spiritual sickness. The truth is that all of us are to one degree or another sin-sick, that is, we’re ‘works in progress;’ as St. Paul says, we must “work out our salvation with fear and trembling,” (Phil. 2:12) if we’re to grow in our relationship and communion with God, be deified, and find spiritual healing, that is, salvation in Christ. And God gives us a sure and prescribed path toward our healing, our growth, and salvation through His Church. He teaches us how to pray and fast through the Church, and so, we pray daily the prayers of the Church and attend the divine services, following the fast as much as able. He gives us Confession through the Church as a means to be freed of our passions, and so, we take seriously our preparation for Confession and get ourselves to Great Vespers as often as possible, since this is part of that prescribed and normal preparation in the Church for Confession and reception of the Gifts of Christ at the Divine Liturgy. Christ feeds us with His Body and Blood in the Eucharist, so we take seriously our preparation through prayer and fasting and Confession to receive those greatest of Gifts, that is, Christ Himself, so that they may have a deifying affect on us for our healing. Through all these ‘tools’ we progress in our knowledge and love of God and our salvation. This progress in the knowledge and love of God is meant to be active, never ‘static,’ never status quo. To be deified, we cannot be ‘couch potato’ or ‘arm chair’ Christians. It’s easy to fall into a rut, preferring our own opinions and ways to those of the Church, listening to the culture instead of Christ, taking Orthodoxy on our terms, but that isn’t Christianity and it won’t bring us the healing and growth in the Kingdom that you and I need. Our ongoing willingness to be healed, to progress in our healing, is an integral part of our salvation. We’re saved through our faith that manifests itself thru our actions and deeds, the living out of that faith, the pushing of ourselves to live for Christ and prioritize the life in Him above all else. Faith and works go hand in hand, St. James reminds us. We can’t afford to lay aside our struggle with sin and our obedience to what Christ teaches us through His Church. 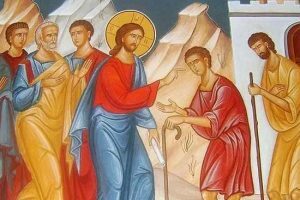 Christ asks the blind men, “Do you believe that I am able to do this?” We’ve been shown the way if we would make use of it. May we each cultivate the attitude of soul and the cooperation of body to follow Christ with all that we have, all that we are, crying out to Him as did the blind men, “Lord, have mercy on us,” knowing that He is the Lord who loves us and indeed has mercy on our souls. Is the Church Divider or Upholder of Unity Among People?